Deion Branch and Taylor Price are looking to see where they fit among the Pats' talented receivers. FOXBOROUGH, Mass. – Taylor Price is entering just his second NFL season. Deion Branch is starting his 10th. The goal for both New England Patriots receivers is the same. They want to show Coach Bill Belichick they can be counted on to produce. Price, a third-round draft choice from Ohio, was active for just the final regular-season game last year but made progress by studying the playbook, watching film and practicing. Now he’s trying to earn playing time in a corps of veteran receivers — Branch, Wes Welker and Chad Ochocinco. Branch had a much better rookie season than Price after being drafted in the second round in 2002. In the opener that year, the Patriots’ next game after the first of their three Super Bowl victories, Branch caught six passes for 83 yards and a touchdown against Pittsburgh. He led the team in receptions in two of the next three seasons. But in the midst of a contract dispute, was traded to Seattle before the 2006 season. He was reunited with quarterback Tom Brady when the Pats acquired him last season, and caught 48 passes in 11 games. Still, he knows he’s competing for playing time. Price’s entry into the NFL hasn’t been as smooth. He missed nearly two weeks of organized team activities last year because Ohio had a late graduation, on June 11, and players weren’t permitted to join their NFL teams before graduation. That set him back. He finished the season with three catches. But in the first exhibition this year, a 47-12 win over Jacksonville, Price caught five passes for 105 yards and a touchdown. He was hit hard after fielding a punt in the fourth quarter, then missed the next game and didn’t return to practice until Monday. Now he’s hoping to play Saturday night at the Detroit Lions. Toughness — shaking off hard hits — is one way to gain Brady’s trust. 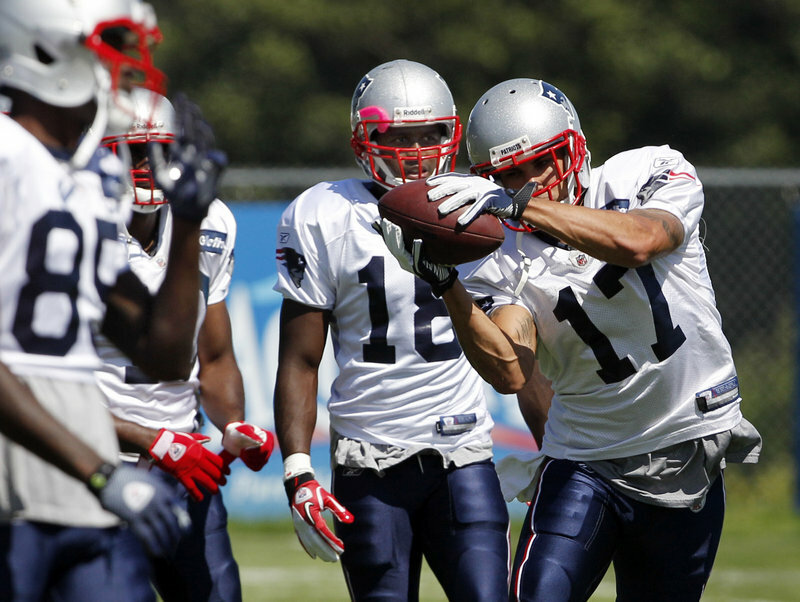 Brandon Tate and Julian Edelman also are competing for playing time at wide receiver.